I like brownies. No, check that. I love brownies. The only flaw in brownies, as far as I can see, is the fact that we always make them in that annoyingly small 8X8 pyrex dish. At my house that only feeds four of us. I’m just being completely honest with you guys. One way to get more mileage out of the flawed, 8X8 brownie set up, is to make cute little mason-jar brownie sundaes. Which we did. For the record, you can’t shove 1/4 of a brownie recipe in a small mason jar. We tried. The small mason jar can hold only 1/4 of 1/4 of the brownie recipe. 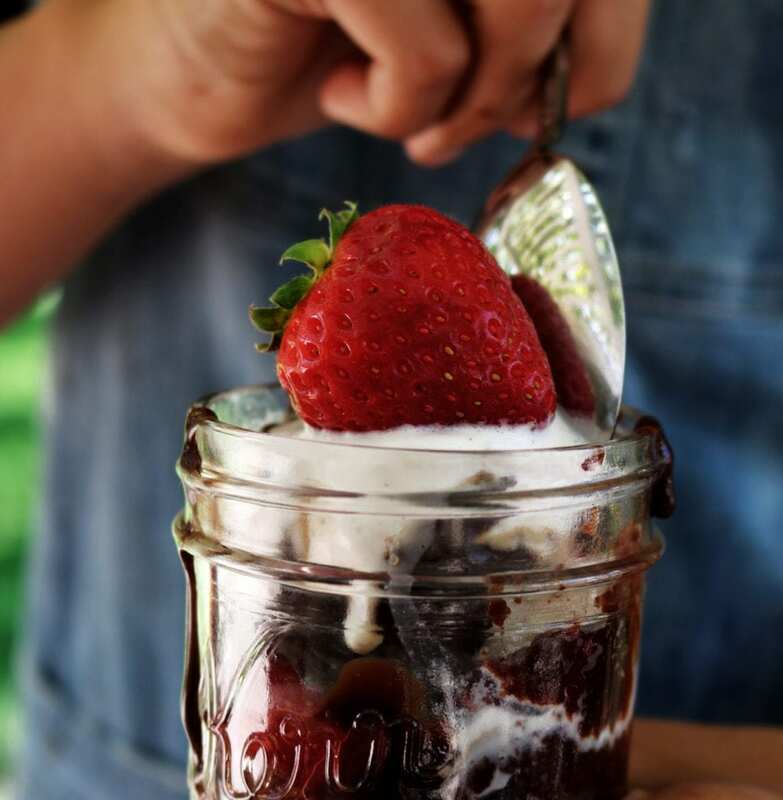 Which means you could actually feed 16 people if you were to make Balsamic Strawberry Brownies Sundaes in petite mason jars. Now the 8X8 pyrex dish is working with us, not against us. Plus it looks reallyyyy cute. 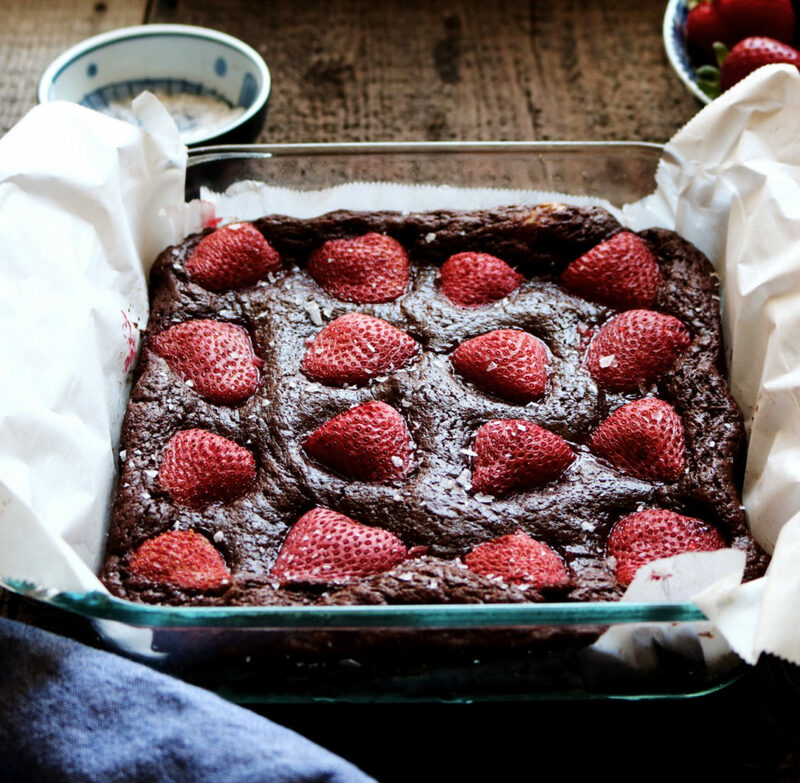 Let’s get our strawberry brownies on. *I tested this with both bread and all-purpose flour and found that both worked great with little (if any) noticeable differences. Preheat the oven to 350 degrees F. Make sure you have a rack in the middle of the oven. Butter or use nonstick spray on a 8X8 pan. If you’re feeling it, put parchment paper in there…you’ll need to cut it so that it fits nicely. Using parchment paper will make it easier to pull the brownies out of the pan when done. In a large, microwave-safe bowl add your chopped semi-sweet chocolate, butter and sunflower seed oil. Microwave on high for 1 minute. You could also use a double boiler for this step…I find that the microwave is quicker with less clean up. Do not overheat your chocolate. Stir the chocolate-butter mixture until smooth and free of lumps. Add the brown sugar, granulated sugar and balsamic vinegar to the chocolate and stir until completely blended. Add the three eggs to the chocolate mixture and stir until well-mixed. Now you have two options at this point. You can either whisk your dry ingredients (flour, cocoa powder, salt and baking powder) in a separate bowl or you can sprinkle directly on top of the chocolate mixture. I do the latter which is totally baking sacrilege. But I have seriously tested this so many times and it works just fine. I do like to make sure that I sprinkle the baking powder all over so it’s not just dumped in one spot. Let your conscience be your guide. You have to admit the idea of dirtying just one bowl is pretty exciting? Mix the brownie batter until it is JUST combined. Do not over-mix. Pour the batter into your prepared 8X8 dish. Use the back of your spoon to even the top a bit. Additionally tap the dish on the counter a couple of times to release any air bubbles from the batter. 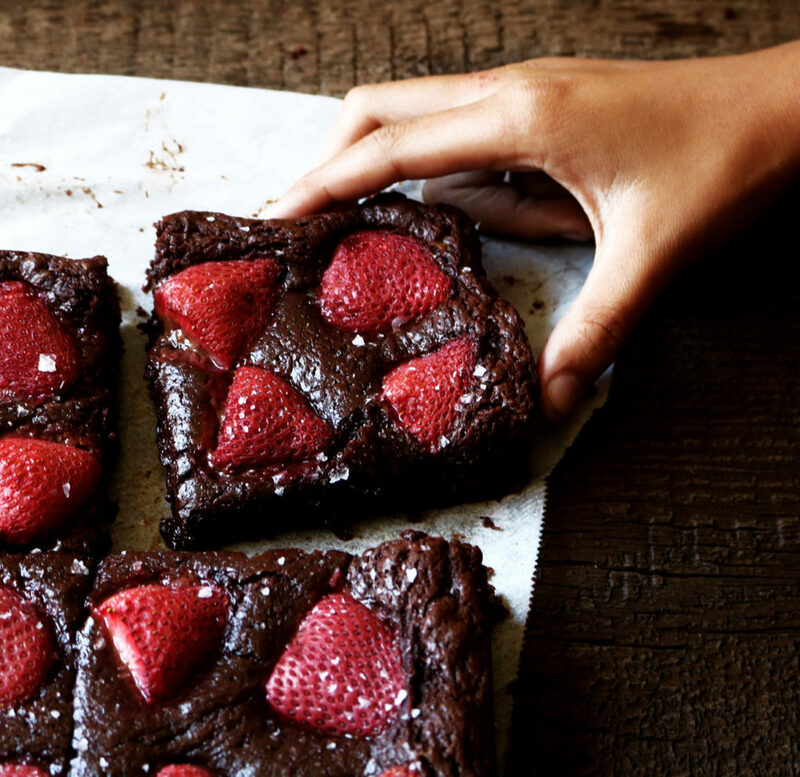 Place the strawberry halves, cut side down, on top of the brownie batter. Put the dish with the brownies in the oven on the middle rack for 25 minutes. When done, they will have a bit of jiggle in the middle and if you test with a toothpick a wee bit of batter will coat it. This is a good thing. Now here is the most challenging part of brownie making…letting them sit there for 1-2 hours (or more) to cool. It’s brutal. And beyond my capabilities. Which is why my brownies are never cut perfectly. In fact I read that if you put your brownies in the fridge to cool they will be extra chewy and fudgy. I’ve never been able to wait long enough to try that. Let me know how that works out for you. 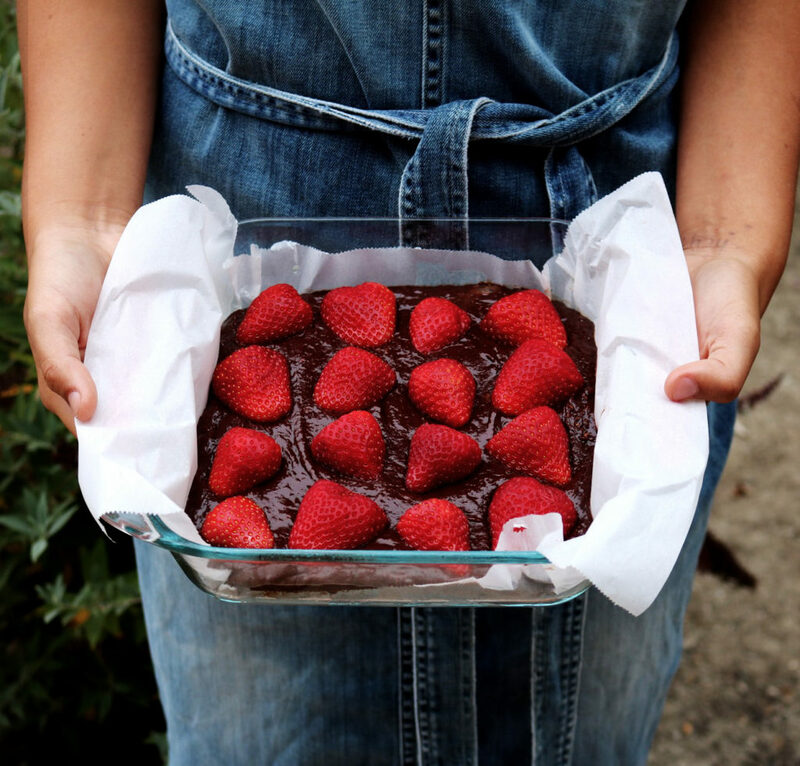 When it’s time to cut the strawberry brownies, use a very sharp knife (a bread knife works great), cut straight up and down and use a wet paper towel to clean off the knife and get as clean of a cut as possible. These are UBER fudgy…the longer you wait to cut them, the better they will look. These become even more seductive and forthcoming when topped with vanilla ice cream, chocolate sauce + more strawberries. Be sure to check out the other strawberry recipes: Strawberry Cardamom Torte + Strawberry Freekah Salad With Strawberry Tahini Dressing! We still have a few more weeks of summer and we’re holding on strong. In a tropical country and humidity is high . May I ask if this brownie keeps well at room temperature or better in the fridge . Thank you . Can I make these a day before? Are they ok to sit out for a day with the strawberries? These turned out sooooo good. Making them again today. I did bake them a smidgen longer than you suggested though but they still came out fudgey. Love the combination of flavours! Thanks for sharing! no joke. my 10 year old has asked to live with you. his two favorite things in this world (other than his mom eh hem) are strawberries and chocolate. i showed him your post and mind. blown. hope you’re ready for a shipment of a very sweet, yet somewhat picky 10 year old. 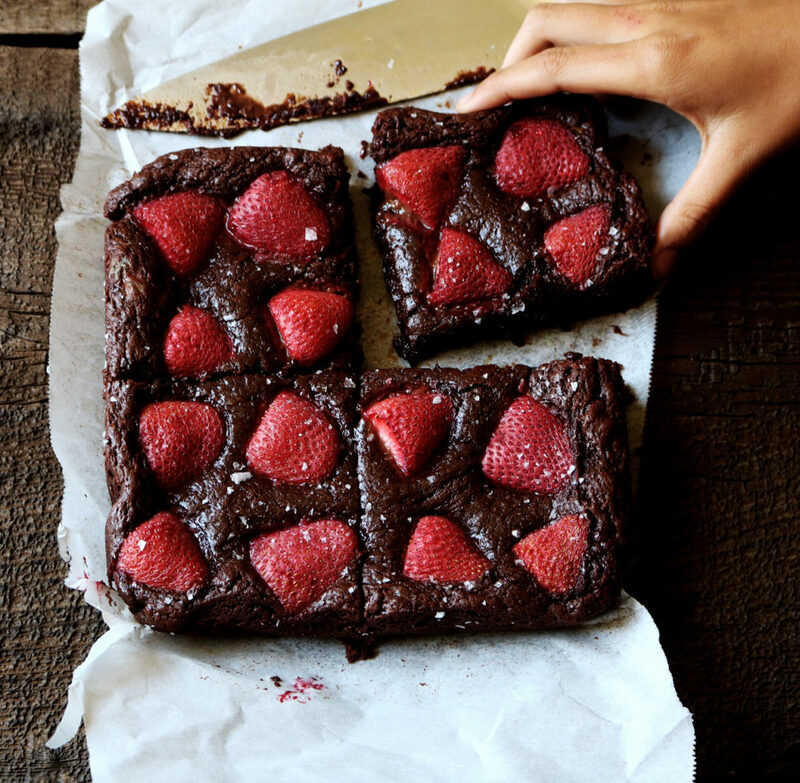 Beautiful brownies! Great treats for kids right? I love the texture of your brownies!! sooo gooey and delicious! !